From summer vacations to winter holidays, it seems each season offers the perfect excuse to put off our to-do list. But be careful, homeowners: neglecting your home’s maintenance could put your personal safety—and one of your largest financial investments—at serious risk. The good news is, by dedicating a few hours each season to properly maintaining your home, you can ensure a safe living environment for you and your family … and actually increase the value of your home by one percent annually!1 You just need to know where and how to spend your time. Use the following checklist as a guide to maintaining your home and lawn throughout the year. It’s applicable for all climates, so please share it with friends and family members who you think could benefit, no matter where their home is located. After a long, cold winter, many of us look forward to a fresh start in the spring. Wash away the winter grime, open the windows, and prepare your home for warmer weather and backyard barbecues. Be sure to tackle those areas that may have gone neglected—such as your blinds, baseboards and fan blades—as well as appliances, including your refrigerator, dishwasher, oven and range hood. Clear out clutter and clothes you no longer wear, and toss old and expired food and medications. Depending on the type of heating system you have, you may need to shut your system down when not in use. Check the manufacturer’s instructions for proper procedures. Walk around your house and look for any signs of damage or wear and tear that should be addressed. Are there cracks in the foundation? Peeling paint? Loose or missing roof shingles? Make a plan to make needed repairs yourself or hire a contractor. Gently rake your lawn to remove leaves and debris. Too many leaves can cause an excessive layer of thatch, which can damage the roots of your lawn. They can also harbor disease-causing organisms and insects.7 However, take care because overly vigorous raking can damage new grass shoots. While a healthy lawn is the best deterrent for weeds, some homeowners choose to use a pre-emergent herbicide in the spring to minimize weeds. When applied at the right time, it can be effective in preventing weeds from germinating. However, a pre-emergent herbicide will also prevent grass seeds from germinating, so only use it if you don’t plan to seed or sod in the spring. After a long winter, planting annuals and spring perennials is a great way to brighten up your garden. It’s also a good time to prune existing flowers and shrubs and remove and compost any dead plants. If you have a sprinkler system, check that it’s working properly and make repairs as needed. If you have a deck or patio, inspect it for signs of damage or deterioration that may have occurred over the winter. Then clean it thoroughly and apply a fresh coat of stain if needed. If you own a pool, warmer weather signals the start of pool season. Be sure to follow best practices for your particular pool to ensure proper maintenance and safety. Summer is generally the time to relax and enjoy your home, but a little time devoted to maintenance will help ensure it looks great and runs efficiently throughout the season. Make sure they are set to run counter-clockwise in the summer to push air down and create a cooling breeze. Utilizing fans instead of your air conditioner, when possible, will help minimize your utility bills. Be sure to clean or replace your filters monthly, particularly if you’re running your air conditioner often. Help cut down on summer utility bills by cleaning your laundry dryer vent at least once a year. Not only will it help cut down on drying times, a neglected dryer poses a serious fire hazard. If you’re running your air conditioner in the summer, you’ll want to keep the cold air inside and hot air outside. Check weather stripping around doors and windows to ensure a good seal. Your lawn will probably need regular mowing in the summer. Adjust your mower height to the highest setting, as taller grass helps shade the soil to prevent drought and weeds. Ensure your lawn and garden get plenty of water during the hot summer months. Experts generally recommend watering in the early morning to minimize evaporation, but be mindful of any watering restrictions in your area, which may limit the time and/or days you are allowed to water. To prevent weeds from taking over your garden and ruining your home’s valuable curb appeal, make a habit of pulling weeds at least once per week. Remove any standing water and piles of leaves and debris. Inspect your lawn and perimeter of your home for signs of an invasion. If necessary, call a professional exterminator for assistance. Fall ushers in another busy season of home maintenance as you prepare your home for the winter weather ahead. To ensure safety and efficiency, it’s a good idea to have your heating system serviced and inspected before you run it for the first time. If you have central air conditioning, you can have it serviced at the same time as your furnace. If you have a portable or window unit, ensure it’s properly sealed or remove it and store it for the winter. Fire safety experts recommend that you have your chimney inspected annually and cleaned periodically. Complete this task before you start using your fireplace or furnace. Check windows and doors for drafts and caulk or add weatherstripping where necessary. Fall is a great time to plant perennials, trees, shrubs, cool-season vegetables and bulbs that will bloom in the spring.12 It’s also a good time to reseed or sod your lawn. Once the leaves start falling, it’s time to pull out your rake. A thick layer of leaves left on your grass can lead to an unhealthy lawn. Or, rather than raking, use a mulching mower to create a natural fertilizer for your lawn. Inspect your gutters and downspouts and make needed repairs. Check the roof for any broken or loose tiles. Remove fallen leaves and debris. If you have a sprinkler system, drain any remaining water and shut it down to prevent damage from freezing temperatures over the winter. If you have a pool, it’s time to clean and close it up before the winter. While it can be tempting to ignore home maintenance issues in the winter, snow and freezing temperatures can do major damage if left untreated. Follow these steps to ensure your house survives the winter months. Check and change filters on your heating system, per the manufacturer’s instructions. If you have a boiler, monitor the water level. If you own a portable generator, follow the manufacturer’s instructions for proper maintenance. Make sure it’s working before you need it, and stock up on supplies like fuel, oil and filters. Make sure pipes are well insulated, and keep your heat set to a minimum of 55 degrees when you’re away. If pipes are prone to freezing, leave faucets dripping slightly overnight or when away from home. You may also want to open cabinet doors beneath sinks to let in heat. Before the first freeze, drain and shut off outdoor faucets. Place an insulated cover over exposed faucets, and store hoses for the winter. Removing screens from your windows allows more light in to brighten and warm your home during the dark, cold winter months. Snow can also get trapped between screens and windows, causing damage to window frames and sills. Don’t wait until the first snowstorm of the season to make sure your snowblower is in good working order. Check the manufacturer’s instructions for maintenance or have it serviced by a professional. Keep plenty of ice melt, or rock salt, on hand in preparation for winter weather. Look for brands that will keep kids and pets safe without doing damage to your walkway or yard. 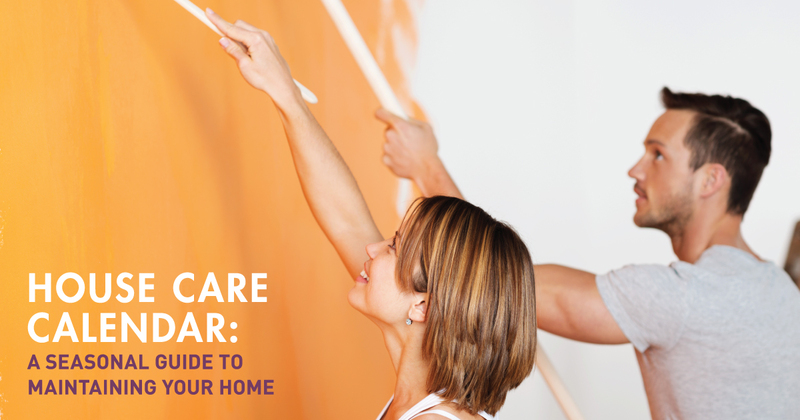 While this checklist should not be considered a complete list of your home’s maintenance needs, it can serve as a general seasonal guide. Systems, structures and fixtures will need to be repaired and replaced from time-to-time, as well. The good news is, the investment you make in maintaining your home now will pay off dividends over time. Keep a record of all your maintenance, repairs and upgrades for future reference, along with receipts. Not only will it help jog your memory, it can make a big impact on buyers when it comes time to sell your home … and potentially result in a higher selling price. Are you looking for help with home maintenance or repairs? We have an extensive network of trusted contractors and service providers and are happy to provide referrals! Call or email us, and we can connect you with one of our preferred vendors.